Vote for the person or group you think is most deserving of the People’s Choice Award! Click here to vote for Fran Hawkins & HanesBrands! Nominated by: Samaritan Ministries – Fran Hawkins was one of the original Samaritan Ministries Soup Kitchen volunteers when we first opened in 1981, and she has continued to serve with undiminished joy off and on over the years. A weekly volunteer with the Wednesday team, Fran is committed to brightening the day of each guest that sits at table number seven. Regulars who make a point to sit with her each week and first time guests alike are welcomed with open arms and often remark on the genuine interest she shows in hearing about their day. Her sense of humor can quickly turn a potentially tense interaction into a congenial moment, and she always goes out of her way to make sure those around her are at ease. She has also volunteered in the overnight shelter with her church, Highland Presbyterian, to serve dinner and breakfast to our shelter residents and assist with watching the front desk during the night. Despite the long hours and cramped quarters, she always leaves in the morning with a smile on her face and a grateful spirit. Fran has truly served as a living example of the Samaritan Ministries mission statement, “Providing food, shelter and hope through Christian love,” in each of the 220 hours she has volunteered over the past year. 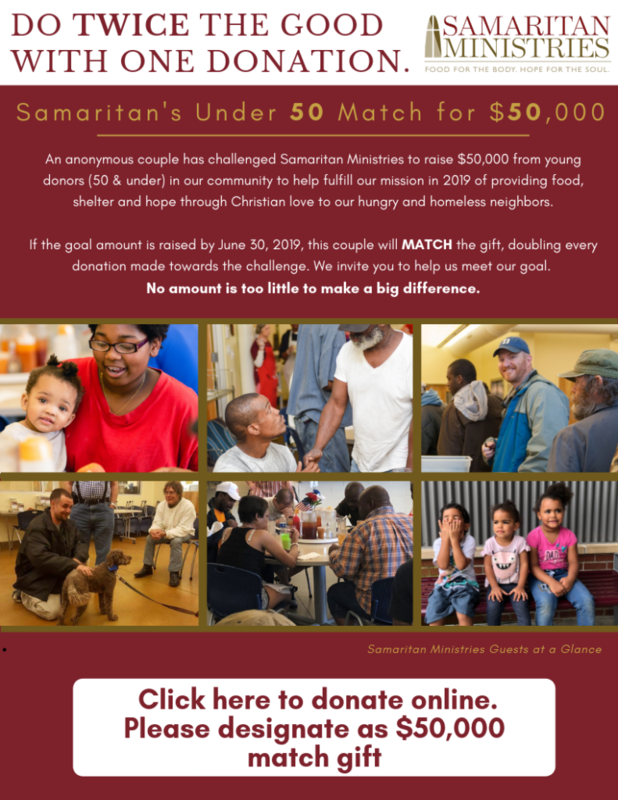 Nominated by: Samaritan Ministries – HanesBrands has been a steadfast community partner of Samaritan Ministries since the early years of our Soup Kitchen and Shelter. Through Board representation, volunteers and donations, HanesBrands has always demonstrated a strong commitment to serving the hungry and homeless members of our community in a tangible way. This commitment has only grown over the past year under the leadership of their Global Director of Corporate Communications, Carole Crosslin. In addition to serving on the Board, Carole has spearheaded a monthly volunteer group in the Soup Kitchen that has been a great help in preparing and serving the daily lunch meal to 300-400 guests. In honor of Giving Tuesday, a group of HanesBrands executives (including the CEO) coordinated a day of service in which they distributed socks, underwear and fleece jackets to over 530 individuals between the Shelter and Soup Kitchen. All in all, HanesBrands employees have collectively volunteered over 350 hours of their time at Samaritan Ministries in the past year. Whether they were scrubbing pots and pans, serving lunch or handing out much needed clothing, the HanesBrands volunteers have never hesitated to ask what more they could do to help. The staff and volunteers of Samaritan Ministries are very grateful for their continued partnership and dedication to serving our guests.